Wondering how to Print and Cut with a Cameo Silhouette? Check out how it did it in THIS VIDEO. *Check Amazon for Sticker Paper sheets for your Printer too! Inside you will find both a Deskset and Planner Pretties. All Deskset Printables come 8.5x11 in PDF Format and JPG Format. 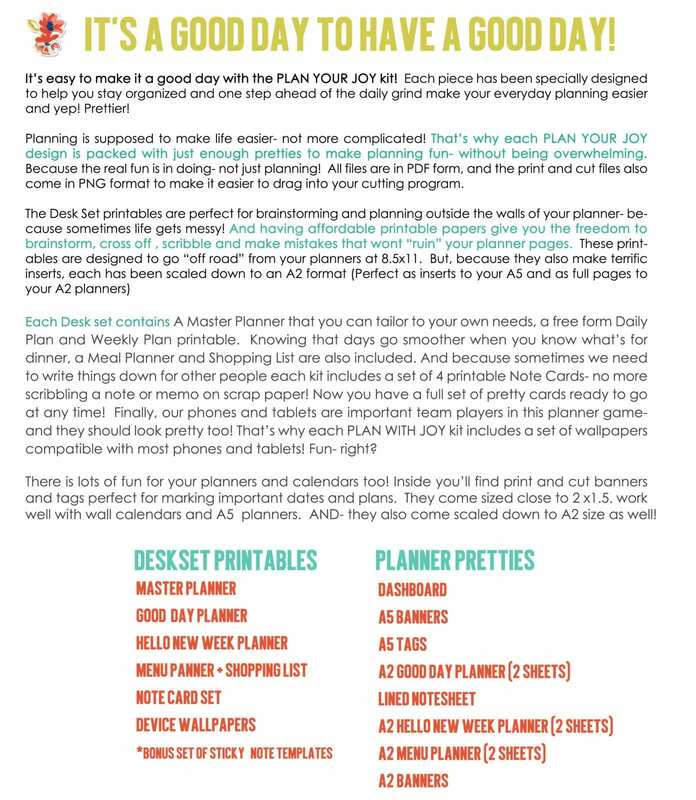 as well as Personal Sized A2, like the Websters Personal Planner. 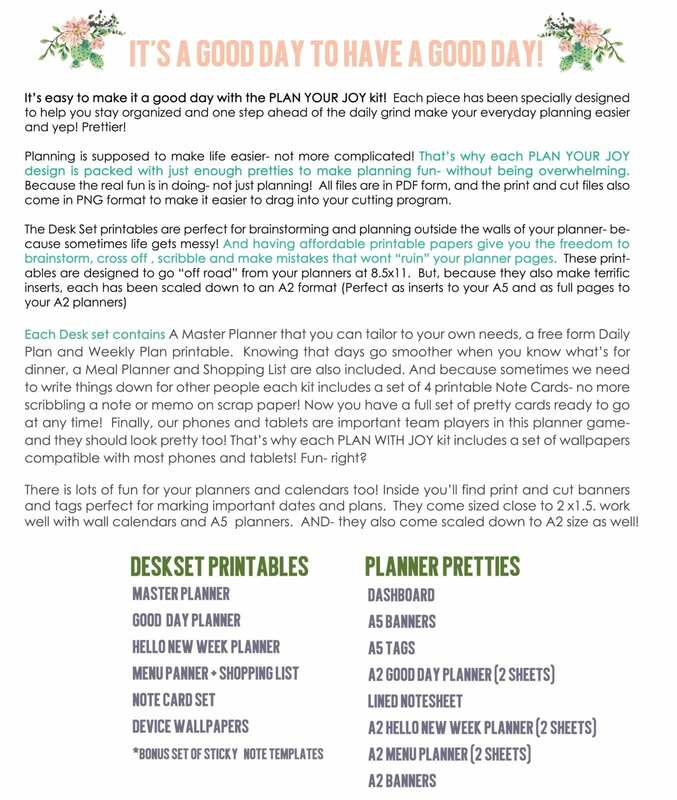 Planner Pretties come in PDF as well as PNG for easy cutting with machines such as the Silhouette. Here's the thing- the Holidays can be stressful. And the last thing I wanted to create was a set of organizational sheets that were all work and no fun. For example, the Advent Calendar included inside requires no trips to an ice skating rink, no snow- and very little money. Just print out the two sheets, cut the doors on three sides with a craft knife and paste together. Most of the little joys revealed are free- but all are special. Some may even become Holiday traditions. There are no gift buying lists or budget lists or cleaning charts- really- do you need those? (They stress me out!) How about a little print and play gift for yourself instead, designed to bring a little DIY Holiday joy to your everyday! Inside you'll find sweet little note cards you can print and gift, patterned papers you can print and use to cover a notebook you can customize for yourself, a delicate banner to hang at your desk of in a special little corner, meal planning lists and everyday shopping lists decorated in holiday style. And yes! 2x1.5 Stickers that will add seasonal cheer to your planners, cards and layouts! 1 sheet of 16 easy Erin Condren friendly ready to cut "Stickers" sized 2h x1.5w on an 8.5x11 sheet in PDF, JPG and PNG format. PNG format is sized so as not to change dimension when brought into your cutting machine program. With all these pretties- you're sure to become a "Joyful Planner"
Files are all formatted to 8.5x11- no special papers or programs needed! Simply print and play! The dashboard/page divider is half page size- and will fit well into most sized planners. Simply cut or fold- punch holes were you need them and you are ready to go! All files were designed to be easy to cut- faint guidelines are provided. Each file was designed with enough color to make them awesome- but not so much that it will drain your ink supply! Wondering how to Print and Cut with a Cameo Silhouette? Check out how it did it in THIS VIDEO. Looking for tips in using your Cutting machine? I share a few on my YouTube channel here. Let's face it- there's no escaping the daily routine of scheduling, appointments, to-do lists and shopping. But just because it's routine, doesn't mean it can't be fun too! Wouldn't it be nice to wrote your notes on pretty little cards instead of scraps of paper, and make lists on decorated sheets as opposed to the back of used envelopes? 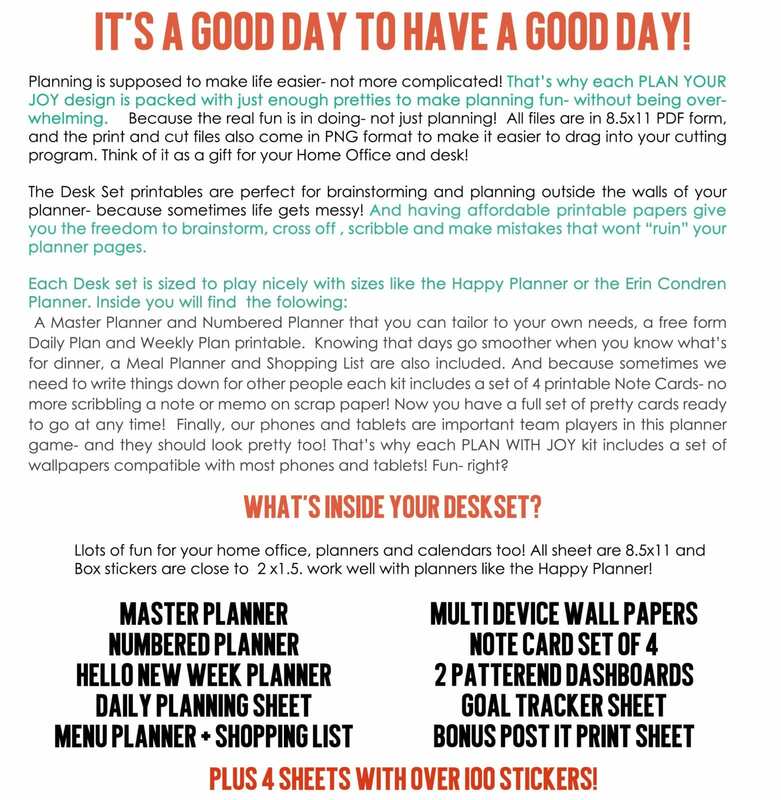 How much nicer would it be to start each month by printing out a set of organization tools that not only make your task keeping easier, but also makes it prettier! Add a little JOY to your everyday with this collection of printables designed to not only pretty up your desk, planners, and calendars but will also play well with your scrapping and project life stash as well! No matter what size calendar or planner you use- you'll find it super simple to pretty it up with the print and cut accessories inside! 1 sheet of 20 easy to cut "Stickers" sized 2h x1.5w on an 8.5x11 sheet in PDF, JPG and individual PNG format. Files are all formatted to 8.5x11- no special papers needed! Simply print and play! The page dividers are half page size- and will fit well into most sized planners. Simply cut or fold- punch holes were you need them and you are ready to go! Whether you choose to use them as word art or cut files- these 10 PNG and SVG sentiments are sure to become a stash favorite when you are looking to add a special touch to your digital and hybrid pages! 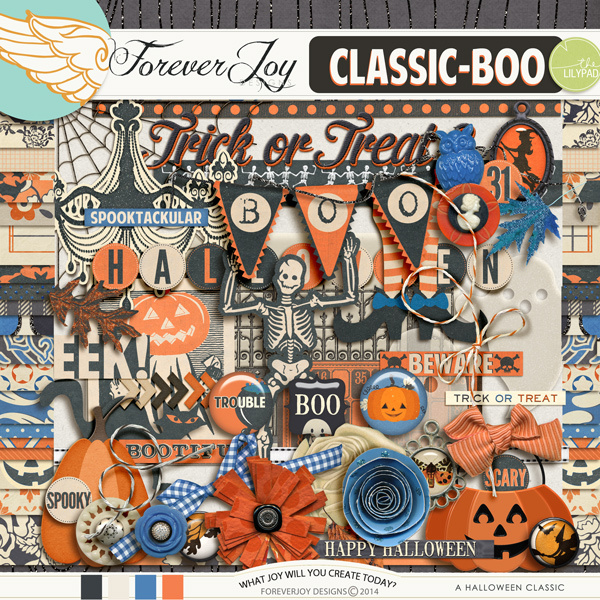 *Please note, this pack contains the Word Art you see in the main preview, layouts may contain items from other designs found in the ForeverJoy Shoppe that are available separately. Important: This product was previously offered in August 2014 as a free download during the We Are Storytellers promotion here at The Lilypad. Please check your supplies before purchasing, you may already own it!